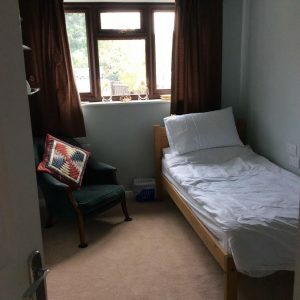 A quiet elderly person who is very lonely is seeking a Sharer to live in their home to give some friendly company and around 15 hours a week of practical help and companionship in their spare time in exchange for the low cost accommodation. The Sharer would live in the property as if they were a friend of the family. The accommodation on offer is a single bedroom with wash basin and a shared bathroom. There is a small garden. A cat lover is essential as there are two fluffy cats! This situation would suit someone who speaks clear fluent spoken English and is working or studying during the day, who is quiet and would enjoy living in a peaceful house. We are looking for a thoughtful and caring sharer, who can share meals/cooking and help with shopping and help to keep this person active and occupied. A driver who owns their own car would be ideal, as this person would sometimes like to be taken out locally and is no longer able to drive themselves. There are two cats in the home so no other pets allowed. If you are interested, please email a little information about yourself, your hours of availability, if you can commit for at least a year, and why you are interested and think you may be suited to this share. We can then give you more details. We charge a monthly facilitation fee EACH MONTH INSTEAD OF RENT of £125 + VAT [total £150] for doing this. You may be asked to make a monthly contribution of up to £25 towards bills. NB Full-time students are exempt from Council Tax.